I like to think I’m fairly well behaved. The majority of what I eat I make myself and is somewhat healthy and well balanced. I find a place for the indulgent dishes (macaroni cheese, dauphinoise and the like) amongst the day to day soups, salads, vegetables and wholegrains. I’m by no means a saint and I think a little indulgence never hurt anyone. When I plan to make something that’s maybe a little bit ‘naughty’ I make sure I go all out. These Chocolate Fudge Cheesecake Brownies are no exception; prepare to enjoy. Grease an eight inch shallow, square cake tin. Preheat your oven to 180C. Gently beat the cream cheese with the vanilla extract and two tbsp of the caster sugar. Mix until smooth. Put the butter, remaining sugars, dark chocolate and golden syrup into a small saucepan and heat gently until everything is combined and smooth. Remove from the heat and leave to cool. Beat the eggs in a large bowl then whisk in the cooled chocolate mixture along with the fudge pieces. Sift the flour and cocoa powder into the chocolate and egg mix then fold everything together. Pour the brownie mix into the prepared tin then dollop the cream cheese mixture over the top. Use a spoon or skewer to marble the cream cheese through the brownie mix. Bake in the oven for 30 minutes or until it’s just coming away from the edge of the tin but is still slightly gooey. These chocolate fudge cheesecake brownies make you pull the face that only a full fat, full sugar, no compromise baked good can; somewhere between falling asleep, pure satisfaction and absolute delight. 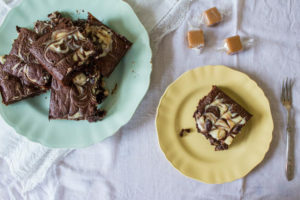 The fudge pieces are slightly caramelised and chewy when the brownies are warm, the cheesecake part adds a slight tang and freshness and it’s all surrounded by gooey, spongey chocolate. You need to use a few different bowls for making these so there’s a little more washing up than some of my usual recipes but trust me, it’s worth it. Just think how many extra calories you’ll burn doing the washing up, just in time for when these are ready to come out of the oven. Finally! A “health food” post in my inbox today! Can’t take any more of those fatty and overbearing salads that everyone is posting! 🙂 These look scrumptious! A best combo! I haven’t had one in ages…now I really crave one! Definitely be naughty once in a while! 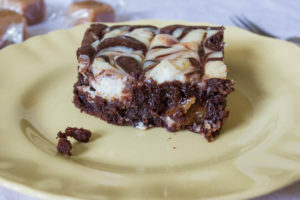 It’s all about balance and a few bites go a long way, especially when we’re talking something as delicious as this chocolate fudge cheesecake brownies. I could never give up brownies! I am drooling. Looks so delicious! Chocolate and cheesecake go so well together. Love how yummy and beautiful these brownies look. Oh you bad girl, this is 3 sweets in one! Love it and want some asap! These bars look delicious…well…we can all enjoy everything…in moderation, although I don’t know if I could stop with one bar. I have NEVER had cheesecake before and thisssssssssss depresses me! Mmm.. cheesecake!! This is mouthwatering and I would love to take a bite of it right now! Wowzer. Really wonderful looking stuff. Decadent — just what I like. 🙂 Thanks! Oh yeah, I could eat two of these no problemo! I’m the same way, if I am going to eat something sweet and chocolatety I want to go all out, love these brownies Caroline. holy COW! These look absolutely CRACKING!!!!! Wish I could reach through my laptop screen!! Definitely my kind of dessert!!! These brownies look scrumptious!!! Little treats every now and then are certainly part of a healthy diet 😉 Looks delicious! 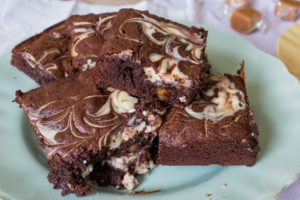 Adding a cheesecake swirl to brownies is one of the best ideas ever! I seriously need some of these right now! They look delicious. Fudge in Brownies! Count me in, an utterly fantastic way to enjoy chocolate! Those sound and look so good! Got to have a treat or two every now and then! Oh my these look like little squares of heaven!